Here’s a parenting tip: Just because an animated film from Japan opens up at a theme park with the Power Rangers and focuses on the singer of a girl group, do not assume you can let your child watch it with you. Because at some point, there might be something in the film that will lead to the kid screaming and running out the room in horror. Always full pre-watch your anime before sharing it with the family is a good rule. Another good rule is that any movie out of Japan with the word “Blue” in the title is not family friendly. Such is the case with Perfect Blue – a legendary masterpiece of Japanese animation that is not family friendly even with a sweet soundtrack. CHAM is a three girl group that’s soaring up the charts when Mima Kirigoe has to quit so she can focus on her acting career. The fans aren’t happy with her not wanting to juggle her career. She has already signed up to star in Double Bind, a cop show. Her band performs one last time at a theme park that also features a version of The Power Rangers. The fans are not happy at her career choice especially a creepy guy who lurks around and calls himself Me-Mania. Things get creepy for Mima fast when she discovers an online website claiming to be her diary entries. Things get horrific when a fan letter turns out to be a letter bomb and hurts a person close to her on the set. She also allows the show to put her in an intense scene because she wants to prove that she can handle serious roles. But the scene does overwhelm her. She begins to lose sense of what is reality, fantasy and acting as time and space slips away from her. Perfect Blue is perfect. It’s also very Blue. This is a psychological thriller that is so perfectly Hitchcock that Brian De Palma must have wept upon seeing the finale. This is like a brilliantly messed up R-rated version of Jem. 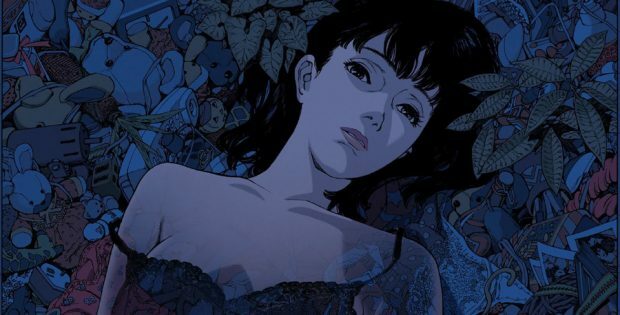 Director Satoshi Kon was able to adapt Yoshikazu Takeuchi’s Perfect Blue: Complete Metamorphosis so that it plays upon so many topics including perception, self-identity, voyeurism and art. What happens when an artist finds themselves in a tug of war between producers, fans and people you trust. The animated nature of the film makes the time when Mima gets unstuck in time seem so believable. Perfect Blue is the perfect adult viewing. The video is 1.78:1 anamorphic. The 1080p upgrade brings up out the details in the background paintings. The audio includes the original Japanese mono mix, Japanese 5.1 remix and an English dub 5.1 remix. Either of the three works although you probably will want to watch the film in English first so you’re able to ingest the visuals without spending too much time reading. The movie is subtitled in English. There is a subtitle for songs and signs in the film. Original SD Version Of Feature (81 minutes) is in English Mono Dolby Digital 2.0. It’a full frame and letterboxed. Lectures By Satoshi Kon Featurette (41:10) discusses elements of the movie. It really does look like a lecture series you’d see as part of an educational video. Angel Of Your Heart Recording Sessions (4:22) features a trio of ladies in the studio singing the big song from CHAM. Angel Of Your Heart Full English Version (4:15) is the English version of the song with a illustration of a boom box. Theatrical Trailers And TV Spots includes trailers for US And UK Re-releases and Japan. The US/UK trailer includes high praise from Roger Corman. Cast And Crew Interviews includes director Satoshi Kon (10:45), Junko Iwao, the voice of Mima in Japan (5:41), Ruby Marlow, the voice of Mima in the English dub (2:41), Wendee Lee, English voice for Rumi (2:21) and Bob Marx, English voice for Me-Mania (2:00) are all to be listened to after you see the film. GKIDS and Shout! Factory present Perfect Blue. Directed by Satoshi Kon. Screenplay by: Sadayuki Murai. Starring: Junko Iwao, Rica Matsumoto, Shiho Niiyama & Masaaki Okura. Rated: Unrated. Running Time: 81 minutes. Released: March 26, 2019.